As the "face" of The Ringling, volunteers perform a variety of functions. Please continue reading for detailed information on the opportunities for which we are currently recruiting. The volunteer opportunities below vary throughout the year and, therefore, may not always be available. Regardless of where they serve, volunteers agree to provide a minimum of 25 hours each year, although some assignments carry an increased level of commitment. These volunteers are specially trained to aide our Marketing Department by representing The Ringling throughout the community and at a variety of public events. This important work brings volunteers together with professional staff in various departments to provide behind-the-scenes support for programs and events. Docents are museum volunteers who are specially trained to engage visitors of all ages and backgrounds in active explorations of our collections. Family Programs Volunteers assist with a variety of facilitated experiences for families with children. These programs typically take place on Thursdays, Fridays, and Saturdays during the academic year and expand to other days in the summer months. We are currently recruiting energetic and highly motivated volunteers to help lead these programs. In addition to orientation and assignment training, successful completion of a Level 2 background check is required prior to involvement. 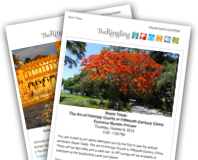 For those who enjoy being outdoors year-round and working during early morning hours, this is an opportunity to assist staff in maintaining The Ringling's beautiful Bayfront Gardens. In addition to greeting patrons, taking tickets and directing people to their seats, ushers provide support in emergencies and set examples of good theater etiquette during matinees and evening performances year-round. Volunteers in this role promote membership at events and assist Membership Department staff in the cultivation and retention of members through a variety of behind-the-scenes projects and general office assistance. Advocates must also be current Ringling members at any level. Store Assistants work alongside staff, restocking and wrapping merchandise and helping visitors select purchases. Offering visitors a warm welcome and providing them with general information about tours, special events, and membership is the important contribution of these volunteers. Volunteers who are already committed to serving The Ringling in other, regularly occurring assignments occasionally assist with functions related to the preparation and execution of special events. Tram Drivers help visitors navigate their way around the grounds, providing free transportation, seven days per week. Drivers must have a valid driver's license and participate in annual safety training.